I found the first one back in the fall, on W. Pratt at California. It’s nothing special in plan or massing, just an ordinary Chicago apartment block, a bit lacking for windows. But it’s clothed in the crazed spirit of the 1960s, when pastels were fine and spots of random color were king. 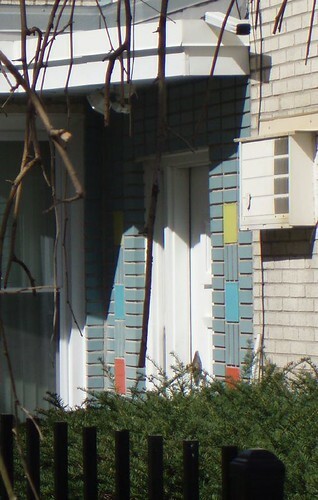 The entry is a confection of 1960s geometrical exuberance, with patterns in blue glazed brick laid against a cream brick background, and accents in colored tile. Blue piers highlight the building’s corners and are used in a decorative grid of squares on an otherwise blank wall. Then I bumped into another one while tooling around Rogers Park. Number 2 is at 1322 W. Chase Avenue, not far from the lake. It doesn’t take much to see the connection. One’s an oddity; two’s a reproduction. Sure enough, hidden behind shrubs and the neighbor’s fence, there’s that same entry detail. But wait! It’s not quite the same — the colors are different, and the tiles are separated by a soldier course of brick. 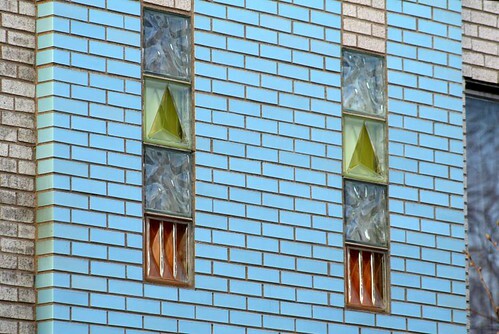 Variations on a geometric theme — sound familiar? 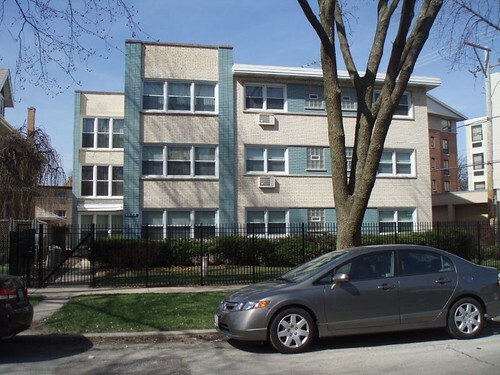 Then as the day wound down, I found a third one — 7241 N. Claremont Avenue, just off of Touhy. If three buildings do it, then, folks, it’s a organization! This one’s the clear winner of the bunch. 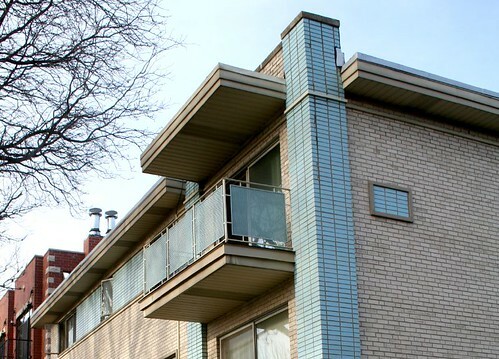 In addition to the blue brick piers, the limestone outlines, and the blue brick squares, it’s got porch railing screens in the same spirit of exalted geometry. It’s had an unfortunate gabled entry cover tacked on, which really should be a flat canopy, but otherwise it’s still looking 60s snazzy. …there stood none other than the elusive geometric pattern blocks! Could this trio be yet another construct of my mystery suburban builder? The M.O. certainly fits. Stay tuned! Edit: I’ve since found another half dozen of these buildings; photos may be seen here. 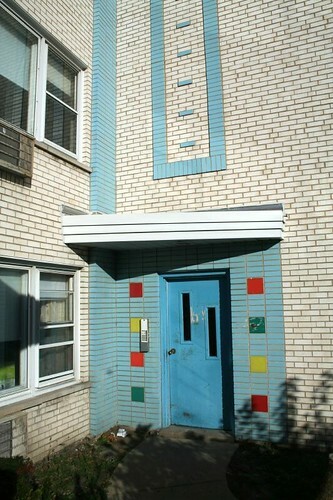 This entry was posted in 1960s Glazed Brick, Architectural Ornament and Materials, Mid-Century Apartments and Flats, Midcentury Modernism, Sculptured glass block. Bookmark the permalink. 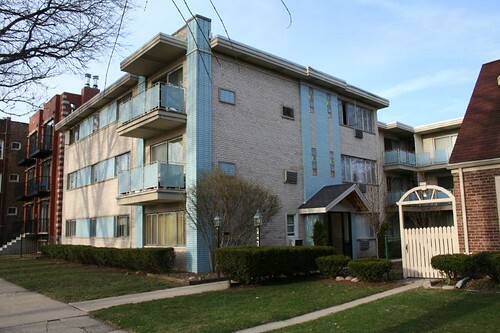 There are two other similar blue brick buildings with colored block on the south side of Touhy between Paulina and Greenview. Not sure if you’ve noticed them or not. Thanks for the tip! I’ll be sure to add them to my collection. I found another one on Devon this evening, too. They’re everywhere! Somebody must’ve REALLY liked the blue-on-cream color combo. I know I really like it!About fifteen years or so ago when the real estate market was not quite so high, my father was interested in buying the building you have in the first couple of photos listed. I believe (but not sure) it was for sale at the time at what he considered a bargain price. 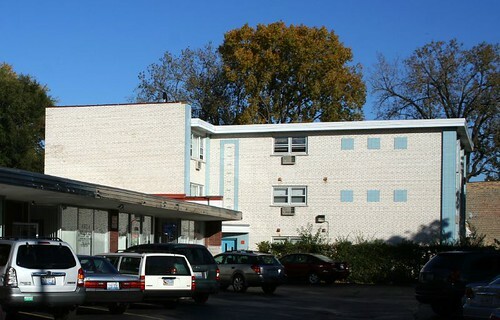 He ended up purchasing another 1950s building, one not quite as colorful or as interesting as this one. lot of work? I have no understanding of coding but I had been hoping to start my own blog in the near future.